Last year, satellites operated by the National Oceanic and Atmospheric Administration (NOAA) materially contributed to rescue operations that saved 207 individuals from life-threatening circumstances in the United States and surrounding waters. This NOAA system of satellites known as Search and Rescue Satellite Aided Tracking System (SARSAT) operates as part of the much larger international COSPAS-SARSAT system headquartered in Montreal, Quebec. Operationally, this constellation of satellites picks up the locations of emergency beacon distress signals and then relays that information to responders. 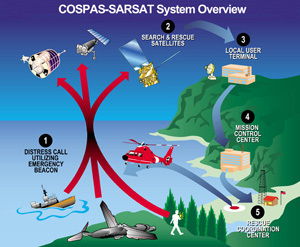 Since 1982, the COSPAS-SARSAT system has been used in more than 30,000 rescues around the world. To learn more, go here. Comment: As noted on NOAA's SARAT information page, because these satellites pin-point the location of a soul in peril, they take the "search" out of Search and Rescue (SAR)!